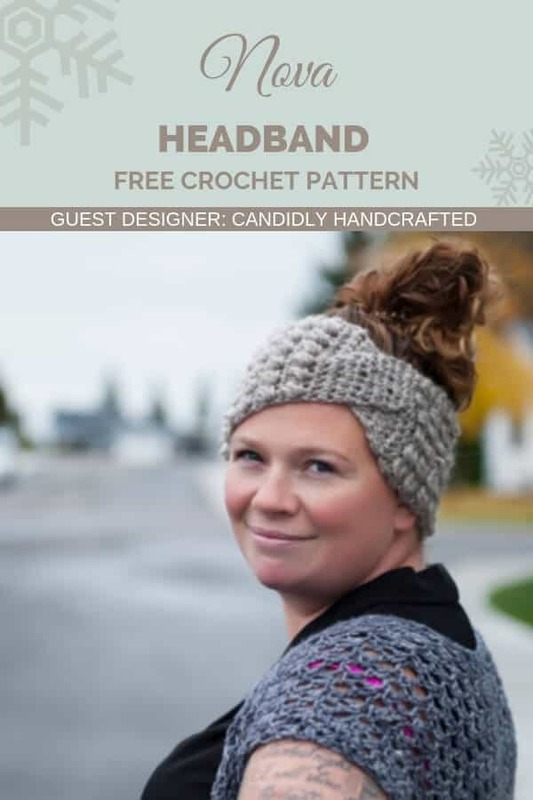 When I saw this photo of Brandie-Lee, I realized this twisted headband crochet pattern is the perfect alternative to a messy bun hat…it’s actually perfect for anyone, long hair or short, but it looks so great with a messy bun, as she’s wearing it here. This project is a quick one and is great when you have lots of gifts to make…like for all your kids’ teachers! The free pattern, below, is in women’s size. If you’re looking for toddler or children’s sizes, they are available in Brandie-Lee’s premium pattern…check the “pattern downloads” section for details. Follow along with the free pattern for the headband for women, below. Purchase the premium version of the Nova Headband on Ravelry. This version contains instructions for toddler and child size headbands (see photo) as well as the women’s size. Hook size 6.5mm Yarn type and yardage Worsted Weight, Approximately 70 yards. Swatch instructions: Follow the pattern repeat to get gauge. Measurement(s): 19” by 5” wide. The right side of the project is the side where the puff stitches ‘puff’ out. The RS will be facing you when you are doing the sc row. The ‘Flaps’ are the two rectangular pieces you will make that will be sewed in an ‘x’ to join the two edges of the headband. Make sure that you end your headband with a sc row before starting the cross flaps. This will make the edge that you slip stitch together look much smoother. When doing the slip stitch to close your head band ensure your headband is flipped wrong side out, it will make the seam less visible on the right side. * I had 20 sc rows & 19 PSt rows for a total of 39 rows. ROW 2: hdc in each stitch across, ch 1 turn (7 hdc) Repeat Row 1 & 2 until your ‘ﬂap’ measures 3 inches. *I had 6 rows total. Pull the flap diagonally across to the beginning of your headband to join. The inside corner of the flap should line of with the outside edge of the headband. SlSt through both pieces in the first sc, and the next 6 stitches. *Remember to do this with the wrong side up, facing you. ROWS 2 & 3 until your ﬂap measures 3 inches. Pull this flap over top the other flap to create an ‘x’, lining up the outside corners. SlSt through both pieces in the first sc, and across. Cut Yarn and fasten off. Weave in all ends. Flip your headband right side out. You are done! I know you’re going to love making the Nova Headband and I so look forward to seeing your finished product. Brandie-Lee Wolbeck started crocheting in 2015 and quickly became hooked. After making hats and sweaters for her own sons, requests from family and friends started rolling in. She launched her crochet business, Candidly Handcrafted in 2016 and jumped right into selling her finished product at markets. In an effort to set herself apart at handmade markets Brandie designed several patterns in 2017. Not only did she sell hundreds of her Yesena toque but she began getting requests for the pattern. A photo of the design went viral on a popular facebook page and she sold over 100 copies of the pattern! Since then she has designed her entire 2018 winter line & has plans to launch several new inspired designs. Brandie-Lee looks forward to designing many more timeless, functional crochet designs for crochet enthusiasts like herself. Question: do you chain 1 at the end of each puff stitch before you single crochet into the next stitch? It didn’t say to in your guide, but quite a few of the puff stitch video tutorials I watched included a chain 1 between the end of a puff stitch and the single crochet in the next stitch.